The effectiveness of interventions has become an important object of scientific study in child welfare and often a prerequisite for funding of child welfare programmes. Many studies on the effectiveness of interventions aimed at supporting families at risk and behavioural change of youth have suggested that features of the relationship between professional and client, and the characteristics of the professional, are decisive for the interventions effectiveness. There are, however, few studies of what is important in terms of relational skills, personal characteristics or communication strategies. 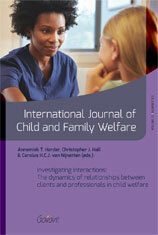 In this special issue, we focus on the dynamics of relationships between child welfare workers and clients (i.e. young people and/or their parents) by using direct observation and close analysis of naturally occurring processes. The contributions to this special issue have a bottom up and a top down approach in analysing relationships. The first part uses a bottom up approach and reports on conversations between youth and family treatment parents in treatment homes. Using a top down approach, the second part specifically focuses on Motivational Interviewing skills of care professionals in their interactions with youth. The third part covers the interactions between parents and professionals in the context of child protection using a bottom up approach.